The Galah seems to be in no danger of disappearing, and the opening up of land due to European agricultural development has probably benefited it. The word 'galah' is an Australian slang word for a rather silly person. A beautiful cockatoo, coloured like no other parrot. It has flamingo pink underparts, soft gray upperparts, and a white cap and crest on the head. 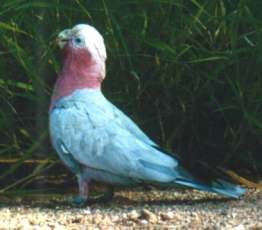 Galahs are usually seen in flocks, sometimes quite large in rural areas. The call is a high. wheeling not unpleasant screech. It is a seed-eater, usually seen nibbling at ground level, and thus also considered a crop pest and persecuted by farmers.